modern white nativity scene for tabletop with gift box. nova68 miniature nativity scene set with 10 porcelain figurines. special: $59.99 instead of $80.00. looking for our miniature white nativity set in porcelain? a customer favorite; this beautiful tabletop-sized porcelain nativity scene set is absolutely stunning and will certainly become the center of your holidays. 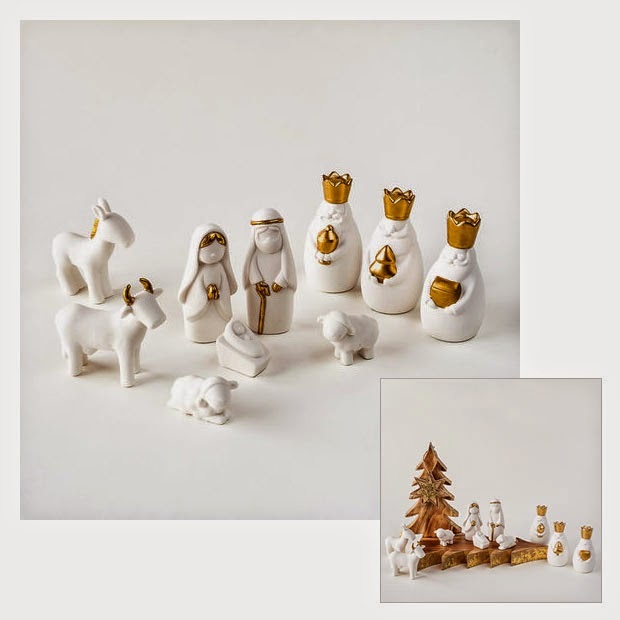 meticulously crafted from white glazed porcelain; this modern nativity set is simply perfect. gold accents are applied by hand to create a rich and warm appearance. spare and simple, our re-creation of an age-old story is transformed into a work of art with a modern and stylish edge. each nativity scene comes complete with the 10 figurines as pictured (wooden setting is not included). tallest figure measures 4" tall; small sheep measures 2" tall. packaged in a box suitable for gift giving. price is for our 10-pc porcelain figurines; wooden backdrop setting is not included and is for display purposes only.